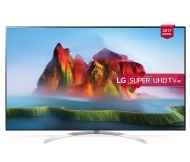 alaTest has collected and analyzed 87 reviews of LG 65SJ850 Series. The average rating for this product is 4.7/5, compared to an average rating of 4.6/5 for other products in the same category for all reviews. We analyzed user and expert ratings, product age and more factors. Compared to other products in the same category the LG 65SJ850 Series is awarded an overall alaScore™ of 89/100 = Very good quality. "I've had a 55” OLED for 6 months in the living room and bought this for our extension. To be perfectly honest I can't tell the difference. Black blacks and fantastic colours. Very surprised by this tv. " "Love the 4K features and the excellent quality picture"
I M HAPPY WITH THIS PRODUCT BUT DONT EXPECT A OLEY QUALITY , I HAVE TO SAY SOUND QUALITY IS 5* INDEED! PICTURE QUALITY IS VERY GOOD TOO. LG 55SJ850V. John Lewis delivers!